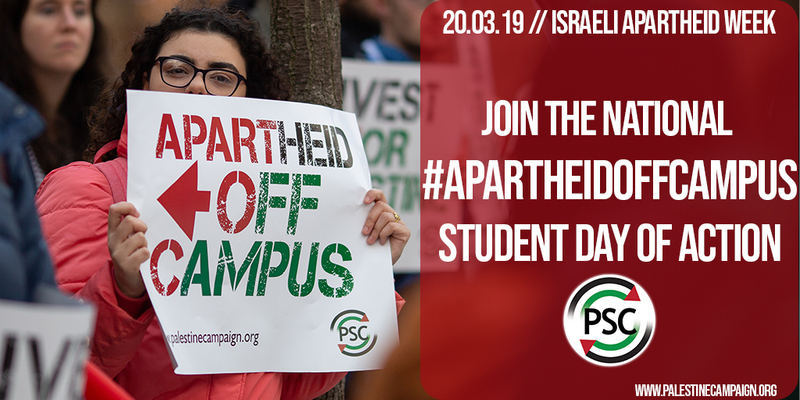 We are calling on student supporters of the Palestinian cause to take creative action on their UK campus as part of a national day of action on the 20th March 2019, during Israeli Apartheid Week (IAW). This is part of an ongoing response to the call from the Palestinian civil society in 2005 for a campaign of Boycott Divestment and Sanctions (BDS) as part of a Palestinian-led movement for freedom, justice and equality. BDS upholds the simple principle that Palestinians are entitled to the same rights as the rest of humanity. IAW is a crucial part of building this movement. UK universities remain deeply complicit with Israel’s apartheid regime through their investment and institutional links, despite many holding “social responsibility policies”. These policies often include restrictions on investing in companies who conduct business which leads to human rights violations. One example includes University of Glasgow, who invest over £17 million worth of shares in companies arming Israel. This includes investments in Caterpillar, who supply armoured bulldozers for the Israeli army, used to demolish Palestinian homes, schools olive groves and communities. This call comes at a time where international solidarity is needed more than ever for the Palestinian people. Since the 30th March, Palestinians in Gaza have been marching to demand their basic rights to freedom. In response, Israel is meeting the protests with live fire, massacring over 240 Palestinians to date. In the West Bank, Palestinian communities continue to be demolished by Israel, in order to build ever expanding illegal Israeli Jewish-only settlements. Palestinians living in Israel continue to be denied the right to live as equal citizens under the law, with Israel’s Nation State law, introduced in 2018, giving a constitutional foundation to a system of entrenched discrimination. 2018 also saw systematic attempts to downgrade the rights of the more than 7 million Palestinian refugees, those expelled by Israel in 1948 and 1967 and their descendants. Israel is seeking, with the support of the US, to remove their refugee status, with Donald Trump preparing a “deal of the century” which seeks to ignore their inalienable right, grounded in international law, to return to the lands and homes from which they have been expelled. Students in the UK have been at the forefront of BDS campaigning for years. Palestinians need our solidarity to accelerate the BDS campaign, to hold Israel accountable for its war crimes, and to hold UK universities to account for their complicity. This IAW, let’s collectively call for Apartheid Off Campus! If you and your group are taking part in the National Day of Action calling on UK universities to get apartheid off campus, please fill in the following form. We will then be able to send you media packs, resources, useful tips and will also be able to collate all the actions across the country for the national media. To take inspiration for your creative action, click here to see pictures from the previous Apartheid Off Campus Day of Action.